ITEM 6604316124 - 24" x 288"
Bearing Bar Height 1-1/4" 1-1/4"
Bearing Bar Thickness 3/16" 3/16"
Clear Space Between Bearing Bars 1/2" 1/2"
Sizes (Width x Length) 24" x 288" 24" x 288"
McNICHOLS® Bar Grating brings safety, strength, durability, and character when installed in either industrial or architectural applications. Common applications include catwalks, factory floors, platforms, railing infill panels, and Stair Treads. A series of bearing bars are welded, swaged and locked, or pressure-locked with perpendicular crossbars to form Grating panels. Bar Grating is a rugged, high-performance, low-maintenance, and slip-resistant product capable of handling pedestrian and vehicular loads. Consider Bar Grating uses and physical requirements for your interior or exterior application. Loading, span and support needs as well as traffic requirements such as pedestrian, hand cart, and vehicular are important considerations. Several Bar Grating products comply with the Americans with Disabilities Act (ADA) when installed to written standards. We invite you to browse Bar Grating applications in our Gallery. Choose from Welded, Heavy-Duty Welded, Swage-Locked, Press-Locked, or Clinched construction types. Determine the series type and name (GW-100, GHB-150, GAL-125, etc.) of the Bar Grating product for your project. Items that comply with the Americans with Disabilities Act (ADA) standard will have this language indicated in the item description of the applicable product. Select the product spacing (the measurement from the center of one bearing bar to the center of an adjacent bearing bar) of the Bar Grating item. Product Spacing (e.g. 19-W-4) refers to the industry specification for Bar Grating products. For example, the first number refers to the bearing bar spacing measured on center (19 = 19/16" or 1-3/16"), the letter refers to the construction type (W = welded), and the last number references the cross bar spacing measured on center (4 = 4"). Select the primary material type including Aluminum, Carbon Steel, Carbon Steel - Powder Coated Black, Galvanized Steel, or Stainless Steel. Inventory is typically "mill finish" for Aluminum, Carbon Steel and Stainless Steel. Hot-Dipped Galvanized, Powder Coated Black or Powder Coated Gray finishes are available for many items. We provide more information on Primary Material Types and Product Finishes in the links provided in the Overview section on the Bar Grating Resources landing page. Choose the bearing bar height and thickness (e.g. 1-1/4" Height x 3/16" Thick) and the shape (Rectangular Bar, I-Bar or T-Bar). Determine if your application requires a smooth, serrated or grooved product surface. Choose the percentage of open area desired in the panel or pieces of Bar Grating. Choose the direction the bearing bars need to run to support the application load. Bearing bar direction is often referred to as span. Clear span refers to the distance in-between Grating supports. Direction of bearing bars is an important installation consideration. Identify the number of panels (width and length) and/or sizes (cut-to-size pieces, areas, Stair Treads) and cut types (random, uniform, equal stub). Areas exceeding standard panel widths are provided in multiple pieces to width. Specify any requirements such as fabrication, banding, notching, cut-outs, toeboards, Stair Treads, non-standard tolerances, etc. Determine if Bar Grating Accessories like Clips or Fasteners/Hardware, Carrier Plates, etc. are needed for your project or application. 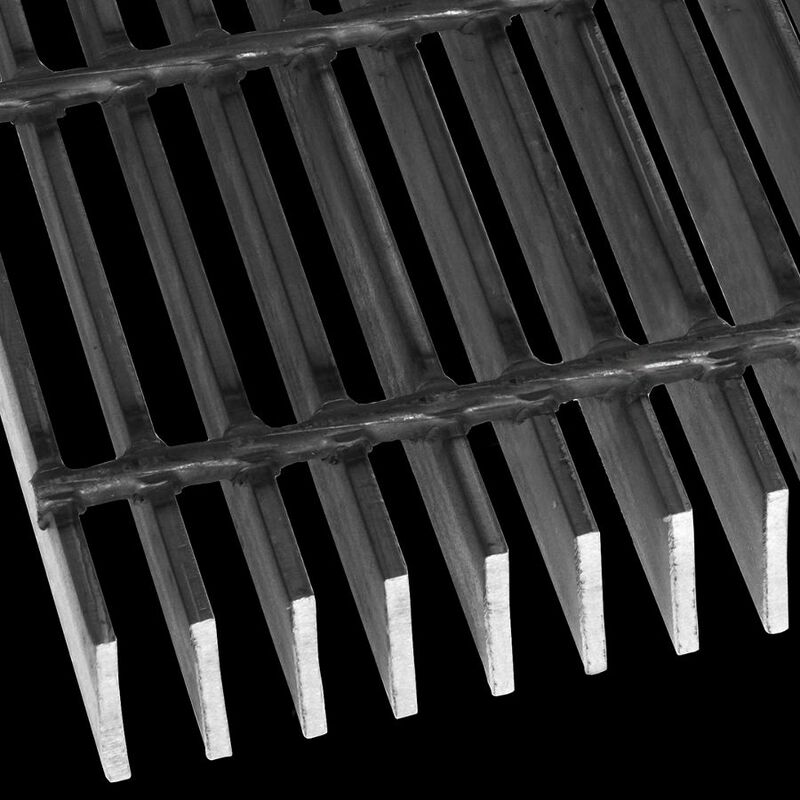 View McNICHOLS® Bar Grating Resources on tolerances, finishes, available sizes, and more! Helpful McNICHOLS® Bar Grating load tables to save, print, or share! Clear Space Between Bearing Bars 1/2"
Sizes (Width x Length) 24" x 288"